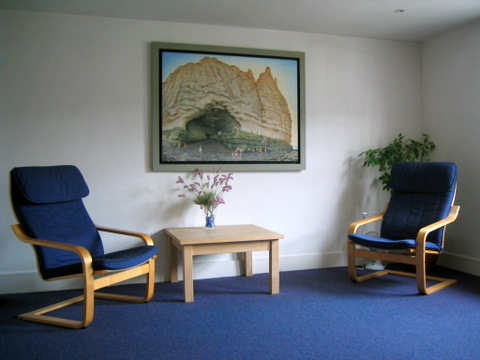 This smaller, more intimate first-floor room is an ideal room to hire in Lewes for small meetings or one-to-one therapy sessions. With good-sized comfortable chairs, and a comfortable two to three-seater settee, the room can easily accommodate up to eight or nine people. The layout adapts equally well to one-to-one or to group use. The room is 4.6m x 4.2m, with a total area of 19.3m2. Additional folding chairs can be provided, but we recommend a maximum of 10 people.